The Sarah Francelia Bell Home, established to provide living assistance for indigent women, was built in 1922 at the bequest and through funds provided by Sarah Francelia Bell in her will in 1911. Although a native of Connecticut, Sarah Francelia Bell (nee McElroy) came to Texas as a young child with her Texas pioneer parents, who joined Stephen F. Austin there in the early 1830s at his settlement called San Felipe de Austin. The Home was constructed and funded by the Trust established with her name for the purpose, as she requested, to provide living assistance for indigent widows of Methodist ministers in Houston. She requested that the Methodist Church manage and administer the Trust in her stead. It was not until 1922 that the Board of the Trust and the Trustees of the "Methodist Hospital Movement," whose membership overlapped, had raised the necessary funds to begin construction. Through their cooperative effort, the Trust Board and Hospital Trustees both not only acted upon the request of Bell, but also were able to establish the Methodist Hospital in Houston. The Methodist Hospital movement had its beginning when Dr. Oscar L. Norsworthy established the Norsworthy Hospital in 1908. He later decided to pursue only medical research and made a generous offer of the facility to the Texas Conference of the Methodist Episcopal Church, South. After a few years of fundraising, the plan materialized when the Trustees chose James Ruskin Bailey, a Houston architect, who was related by marriage to one of the Trustees, and the project was underway. They chose a site for the Home adjacent to the hospital and let the contract for the construction to Central Construction Company on August 16, 1922. Thus, the Sarah Francelia Bell Home and the Methodist Hospital movement was initiated. After construction, the Trustees realized that the Home was underutilized as there were not enough residents to occupy the entire three-story building. Although the Home continued to operate as originally established, the remaining portion of the building was used by Methodist Hospital for additional treatment facilities, and later as the first facility specifically designed for Nurse Housing. When Methodist Hospital relocated and first opened in the "new" Medical Center in 1951, the old site, including the Horne, was sold to various individual owners, who used the buildings for many other purposes. However, the Sarah Francelia Bell Trust continues to provide needed living assistance to women as provided for in the original bequest by Sarah Francelia Bell. It is through her generosity that the Methodist Church provides living assistance at their facilities in Texas, including Happy Harbor Methodist Home, La Porte or Moody House, Galveston, where four women are receiving assistance to this very day. 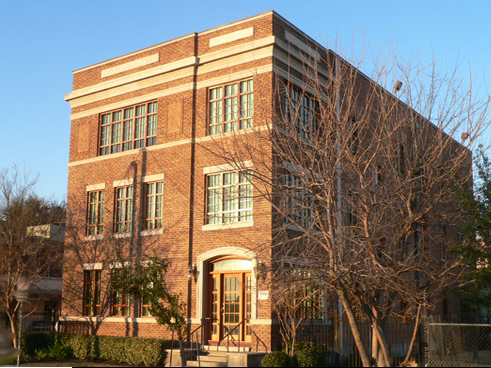 The Sarah Francelia Bell Horne Building remains today as the only physical remnant in Houston, Texas of the first endeavor to establish the Methodist Hospital in Houston, now recognized as one of the best medical facilities worldwide. Moreover, the current Trustees of the Sarah Francelia Bell Trust, whose current assets are approximately $250,000, have ventured to say, "It is interesting to speculate if the great Methodist Hospital of today would even be here now if the Sarah Francelia Bell Trust had not come to its aid back in 1922" when there were shortfalls during early construction and other troubling times during the Great Depression. The Sarah Francelia Bell Home was connected to the Norsworthy Hospital (built around 1908) and the main Methodist structure sometime in the early 1920's according to the Sanborn Fire Insurance Maps. Both the Norsworthy Hospital and the "little hospital" have been demolished. No exterior changes to the Home have been made since its construction, although all original windows were removed and had to be replaced with compatible wood windows. A wood deck and ramp has been installed at the back of the building for ADA purposes. The interior, which had been completely gutted by previous owners and vandals, has been reconstructed as offices.